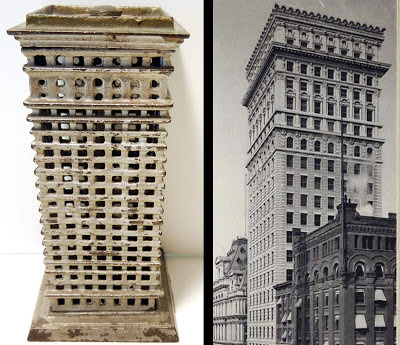 While we can all recognize the Flatiron and Woolworth buildings from their cast iron bank replicas, two others always seemed generic to me. Until Steve V. pointed out that one was a replica of the Park Row building in Manhattan. 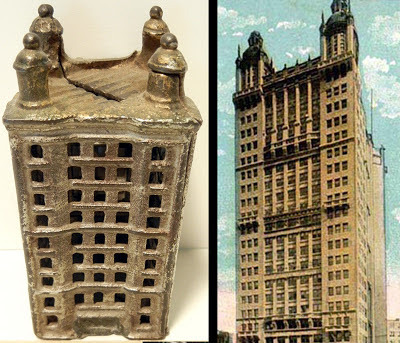 Attributed to the coin bank & toy maker, A.C. Williams, the cast iron miniature has 4 towers on top rather than only 2 like the real building. This bank was made in a few different sizes. The real Park Row Building is on on Park Row in the Financial District of the New York City also known as 15 Park Row. The building was designed by R. H. Robertson, a pioneer in steel skyscraper design. One of the first structures to be called a skyscraper, the building was completed in 1899 and was one of several new office buildings located on what was known at the time as "Newspaper Row," the center of the newspaper industry in New York City for 80 years beginning in the 1840s. At 391 feet (119 m), it was the tallest office building in the world from 1899 until 1908. The foundation of the Park Row Building was made of 3,900 Georgia spruce piles driven into wet sand and topped by granite blocks. The design recalls the double-towered Baroque churches of Europe, and more explicitly echoes the architecture of the church of the Monastery of São Vicente da Fora of Lisbon. 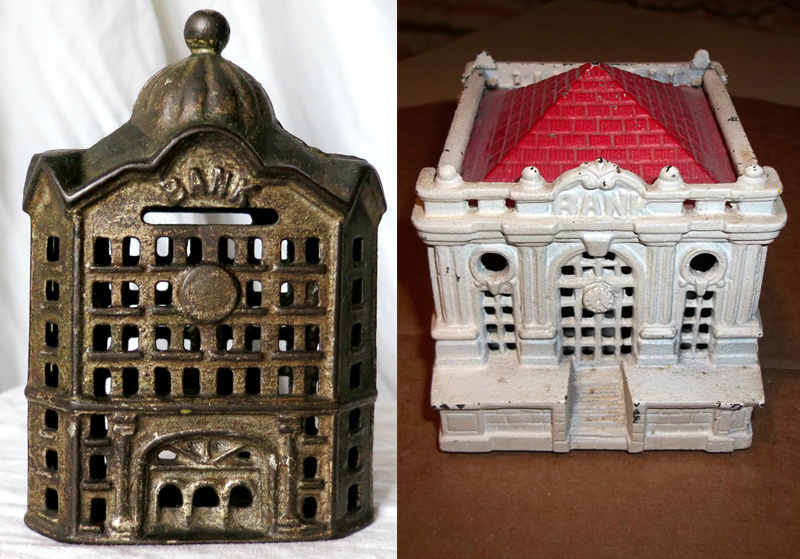 Another cast iron bank resembles the American Surety Building and was made in a few sizes. The real building was constructed 1894-1896 by architect Bruce Price, and was one of Manhattan's first buildings with steel framing and curtain wall construction. At its original 21 stories. Price described his design as "a campanile with four pilaster faces, the seven flutes being represented by seven rows of windows". The building is set on an irregular, trapezoidal lot, and designed as a Neo-Renaissance tower clad in Maine granite with a 3-story base, an 12-story shaft, and a 6-story cap. (Its 4th and 15 stories are transitional.) The base is an Ionic entrance colonnade topped with sculptures in a classical style. Above rises a middle section of horizontally banded piers with vertical strips framing the windows, which culminates in a row of figural sculptures extending from the 14th to 15th stories. A further six-story cap (subsequently modified) featured a colonnade of Corinthian pilasters, stone cornice, and a crowning parapet of gilded metal acroteria on the setback 20th and 21st stories. In 1920-1922, New York architect Herman Lee Meader supervised alterations which included a new L-shaped annex that widened the tower from 7 to 11 bays, and addition of several stories, which greatly modified the original cap. 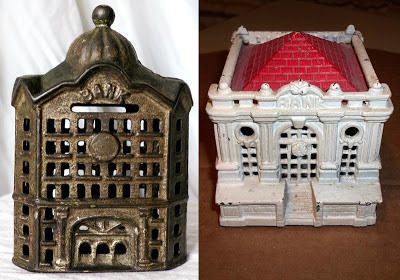 Two other common cast-iron coin banks do seem generic - a domed building and a pyramidal-roofed buildings both which have the word, 'bank.' Can anyone can identify these two buildings? If so, share the information via the 'comments' link below.